Measures 7" x 6" x 4"
Whether you're on a date or hosting a fancy dinner party, lighting is truly the key to setting the "mood." Everyone knows that. And that's especially true when your "guests" are the types who arrive with candy-filled pillowcases and jack-o-lantern pails, hoping to get goodies out of you. It would be a disservice to these special guests to not properly create the right atmosphere... and by that we mean creeping the heck out of them! This Mega Strobe with Thunder is a surefire ticket to making your front porch or Halloween party that much spookier this Halloween! 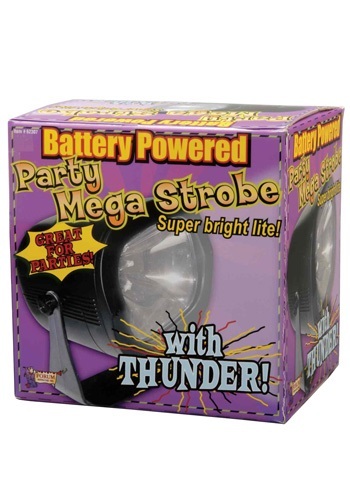 Running on three AA batteries (which are not included, some make sure you've got some in store for the big night), this awesome lighting appliance is super easy to use. It's perfect for a crazy, nightmarish "thunder and lightning" effect that suits the mood perfectly on Halloween. And it goes great with a ghastly, rolling fog, so be sure to have a look around at our fog machines!